This is the time of the year that I snack a lot. When I say a lot I mean I tend to have at least three snacks a day, oftentimes more. I am lucky that I also work-out everyday and inherited my dad's great metabolism. With all my snacking lately, I have been baking a lot this month. There is something about winter that makes me want to bake and eat. This winter has been warmer than most, but not warm enough to do much outside. Since I have been inside so frequently I have experimented with a number of new recipes. Some have been great, others have needed some changes. Today It tried a new recipe for Pumpkin Muffins from the Libby's Pumpkin website which worked perfectly. This recipe has 10 ingredients. It takes 25 minutes of total time, 10 minutes of which is active and makes 20 servings. I made a number of changes to this recipe. The original recipe was for mini muffins. I don't own a mini muffin pan and I'm not a big fan of mini-muffins, so I chose to make full sized muffins instead. Additionally since I eat gluten free I used gluten free all-purpose flour instead of wheat flour. I also used gluten free granola. My baking time was increased to 25 minutes and I rotated the pan halfway through baking time. The recipe uses a mixer to incorprate the ingredients. I chose to mix by hand instead and they worked fine. I followed the remainder of the recipe as written. These muffins turned out very moist. I like that they only use a 1/4 cup of oil and they worked very well being converted to being gluten free. 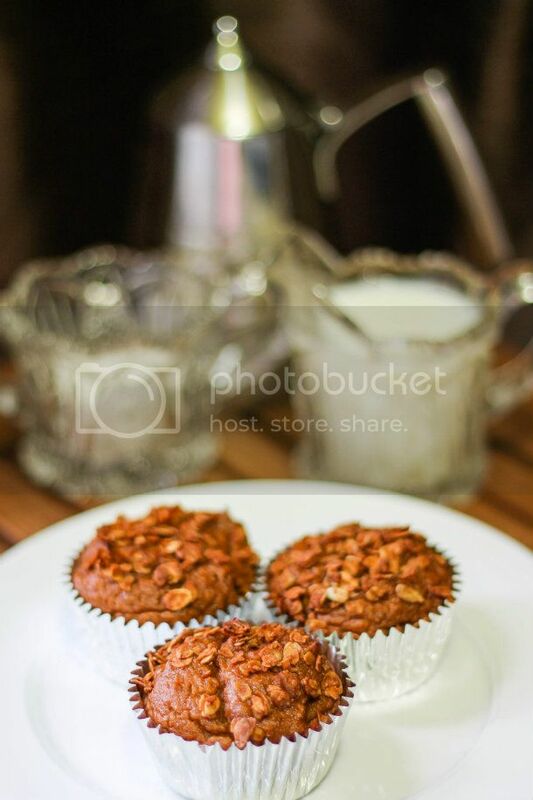 The granola gives the tops of the muffins a nice crunch, which was popular with my two boys. These would also work well with chocolate chips or chocolate granola on top. For the recipe go to Pumpkin Muffins. Your food pics look amazing and tasty! New follower thanks to Mom's Monday Mingle! Thanks for the sweet comment :) Followed you back! I love the idea of adding granola to the muffins. I bet the crunch makes them very lovely! I love granola, it's yummy! "One day I will be so tired of pumpkin scented/flavored everything. That day is not today." Haha, saw these lovely muffins and thought of this quote! I love pumpkin :) I am hit or miss with the candles though! Yummy! I wish I had your metabolism :) My husband is the same way. He can eat whatever he wants, whenever he wants! I get it from my dad :) I do work out also though, at least an hour everyday on the treadmill while I watch tv. Thank you for the follow. We LOVE pumpkin muffins in our house. I'm going to have to try these!